For endovascular aortic repair (EVAR), integrating preoperative information of the aortic anatomy with intraoperative fluoroscopy can aid in reducing radiation exposure, contrast agent and procedure time. However, the quality of this fusion may deteriorate over the course of the intervention due to patient movement or deformation of the vasculature caused by interventional tools. Automatically detecting the instruments present in the X-ray image can help to assess the degree of deterioration, trigger automatic re-registration or aid in automatic workflow phase detection and process modeling. In this work, we investigate a flexible approach to segment different devices based on fully convolutional neural networks using multi-task learning. 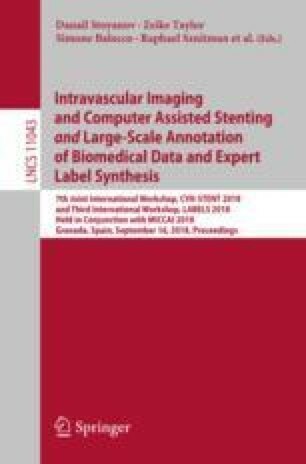 We evaluate the proposed approach on a set of 38 X-ray images acquired during EVAR interventions by targeting the segmentation of aortic stents, stiff guidewires and pigtail catheters. We compare the results to the performance of single-task networks. We manage to keep similar performance compared to single-task networks with Dice coefficients between 0.95 and 0.80 depending on the device, while speeding up computation by a factor of two.